(AP) Joey Votto needs knee surgery, and Jose Bautista is out with a wrist injury. Two of baseball's best hitters were sidelined in a matter of hours Monday, one night before a pair of top pitchers are slated to return to the mound. Roy Halladay and CC Sabathia are both set to come off the disabled list Tuesday  and the way things are shaping up this summer, pennant races all over the majors could be decided by which stars stay healthy. The Cincinnati Reds will try to maintain their slim lead in the NL Central without Votto, the 2010 NL MVP. He was scheduled to have arthroscopic surgery Tuesday to repair torn cartilage in his left knee, keeping the first baseman out of the lineup for three to four weeks. "It is in my best interest and in the best interest of the team to do it now so that I can be healthy during the last two months of the pennant race," Votto said in a statement. The slugger hurt his knee while sliding into third base on June 29 in San Francisco, but continued playing and started for the National League in the All-Star game last Tuesday. A medical exam Monday detected the tear. Reds general manager Walt Jocketty said Votto didn't have an MRI earlier because Votto didn't think he needed one. Votto is batting .342 with 14 homers and 49 RBIs. He leads the NL in doubles, walks, on-base percentage and extra-base hits. "We'll see what we can do internally, initially," Jocketty said. "But it's going to be difficult to replace Joey Votto." The Reds lost their first game without him, 5-3 to Arizona on Monday night. Todd Frazier filled in at first base, but manager Dusty Baker said he will also use Miguel Cairo. The team will "mix and match depending on offensive and defensive matchups," Baker said. The challenge is to stay in contention until Votto gets back. "We've got the guys who can do it," right fielder Jay Bruce said. "The pressure's on, but we've got to step up. I'm confident that we have those guys on the team. "Look at the Dodgers. They lost Matt Kemp, but they weathered the storm. It's early enough that we can weather the storm." It appears the Toronto Blue Jays will have to try to do the same without Bautista for a while. The AL home run champ the past two seasons, Bautista left a 6-3 road loss to the New York Yankees in the eighth inning because of an injury to his left wrist. He hit a long foul ball against David Robertson and immediately grabbed his wrist, dropping into a crouch outside the batter's box. "Through the course of completing the swing he felt a little bit of a popping sensation," Toronto manager John Farrell said. "It's a big blow." 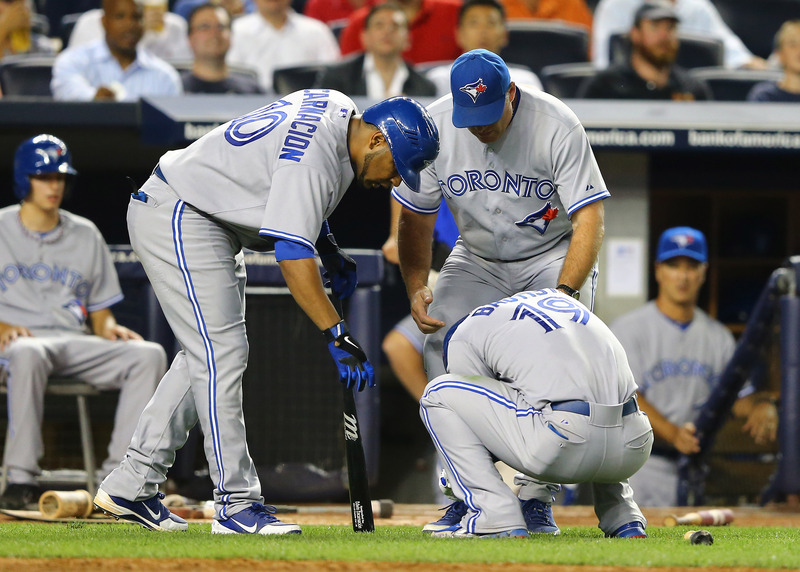 After the game, the Blue Jays said Bautista didn't break a bone, but he has a tendon injury. Bautista was scheduled for an MRI on Tuesday to determine the severity. "There will be a follow-up transaction (Tuesday)," Farrell said. "Certainly, Jose's not going to be ready to go." Already ravaged by key injuries to their pitching staff, the Blue Jays (45-45) are last in the rugged AL East. But they have 15 games remaining with the first-place Yankees and another 10 with Tampa Bay, so they are likely to affect the playoff chase one way or another. Bautista is tied for second in the majors with 27 homers, and his teammates know how valuable he is to their potent lineup. "If it's for long term, it's devastating," reliever Jason Frasor said. "I guess we'll wait and see." Toronto is set to face Sabathia on Tuesday night, when the left-hander makes his first start since June 24 following his initial trip to the disabled list with the Yankees. Sidelined by a groin strain, Sabathia said he is feeling well enough to pitch as long as he needs to and thinks the time off might have been more beneficial to his left arm than the groin. "I'm going to throw until they tell me to stop," he said. Sabathia is 9-3 with a 3.45 ERA, and he earned his sixth All-Star selection this year. Even though the Yankees went 12-6 without their ace and extended their lead in the AL East, Sabathia wasn't happy to miss time. "You feel like you're not contributing and helping the team," he said. "For me it's a little embarrassing." The Philadelphia Phillies are ecstatic about getting Halladay back Tuesday night at Dodger Stadium. They just hope it's not too late. The two-time Cy Young Award winner has missed the past seven weeks because of a strained right lat muscle, one reason the Phillies have faded to last place in the NL East after five straight division titles. Halladay made a successful rehab start Thursday for Class-A Clearwater and threw a bullpen session Saturday with no problems. He didn't think another rehab start was necessary, which suited Phillies manager Charlie Manuel just fine. "Roy's pitched a lot of baseball, so I think he probably knows himself a lot better than we do," Manuel said. "When he says he doesn't think he needs it, I trust him and I believe him." Halladay hasn't been given a set pitch limit, but will be monitored closely by Manuel and pitching coach Rich Dubee. "I'd say six innings would be realistic, probably. But we'll see," Manuel said. "We'll probably work off him." Halladay is 4-5 with a 3.98 ERA in 11 starts. The eight-time All-Star hasn't pitched for the Phillies since May 27, when he lasted only two innings during an 8-3 loss to St. Louis. "It gives us a lot of hope," first baseman Ryan Howard said Monday night after hitting his first homer of the season in Philadelphia's third consecutive victory. "I mean, you have to forget what happened in the first half. We just have to keep doing what we're doing right now as a team and as a unit."